Indian names: Tuttumpin (Paiute), Tutupivi (Kawaiisu) Distribution: All of the southwestern United States and Mexico. Found in deserts and on dry mountain sides. 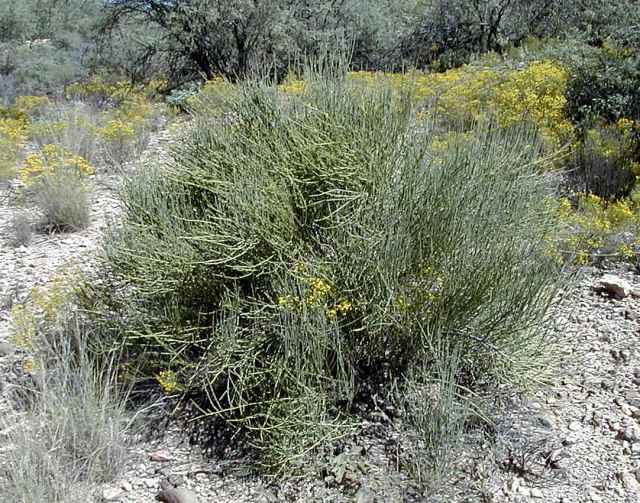 Description: a branched broom like shrub growing up to 4 feet tall, with slender, jointed stems. The leaves are reduced to scales and grow in opposite pairs or whorls of three and are fused for half their length. Male and female flowers, blooming in March and April, are borne on separate plants in cone like structures. They are followed by small brown to black seeds. Cures Bronchial and Lung infections(such as:bronchitis,laryngitis, breathing difficulties and swollen or inflamed Trachea. Drink 1 cup 3 times a day of the brew made from 10 grams of Itamo Real leaves to 1 Liter of Water.